UAA Theatre students in “Earthquake ’64,” an entirely student-created multidisciplinary performance. UAA Department of Theatre’s Brian Cook started working on a collaborative project with students over a year ago to research the earthquake that devastated south central Alaska in 1964 with the purpose of creating a presentation that would explore this defining moment in Alaskan history. 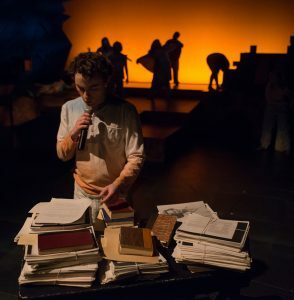 The result is Earthquake ’64, a multidisciplinary performance that weaves personal stories, movement and music together into an exciting evening of theatre. Joining Brian today on Stage Talk are three of those student-collaborators, Adi Davis, Kaeli Meno and Paitton Reid. Earthquake ’64 performs at the Fine Arts Center on the campus of UAA February 16-18. ORIGINAL BROADCAST: Friday, February 16 at 2:45 p.m.